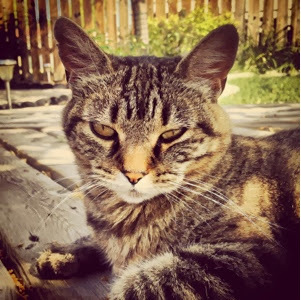 In case you don't read my blog regularly, or follow me on Twitter or Instagram, this is my cat, Scout. She is easily the most well-behaved and wonderful cat ever. No, I'm not biased. Scout used to be an indoor cat only. Then, she turned into an indoor/outdoor cat. Unfortunately, it never crossed my mind that once she was going outside, I needed to be vigilant with getting her annual shots. She is also an aggressive hunter, regularly killing and eating birds and rabbits (but not mice, not to her taste I guess). It's quite funny to imagine, because she is very small. She was the runt and an orphan and never grew to be that big. I honestly don't know how she is able to catch the prey that she does since she is ten years old and missing half her teeth. Well, that hunting skill and my lack of follow-through on getting her shots caused a 4 day emotional roller-coaster at our house recently. I was coming back into the house from walking my daughter to school when I noticed something small, dark and wet looking on the lawn. At first I assumed it was a fur-ball (gross, I know), until I walked closer and realized that it was a dead bat, uneaten but slightly worse for wear. I was surprised, then panicked, when I suddenly realized that Scout wasn't up to date on her shots. I called the vet and was told to bring Scout in for her shots, and to carefully bring in the dead bat to be shipped to Lethbridge for rabies testing. You may think that this was a bit much, it was only a dead bat, right? Well, usually animals aren't able to kill bats unless the bat is already sick. And unbeknownst to me at the time, a woman had been bitten by a rabid bat in Lethbridge only two weeks before. There were a lot of tears and guilt, knowing that if the $150 test came back positive for rabies, we would have to have Scout put down. I couldn't even imagine it, especially for my 8 year old that likes to call the cat her "big sister". Thankfully, the vet called us on Monday afternoon with the good news that the bat was rabies free! Our relief was palpable. Moral of the story - keep your pet's shots up to date. The vet provided us with a print-off of this information regarding rabies. It is thorough and very interesting if you aren't having to worry about a pet or family member having the disease.